Brains....and comics! Jay and Silent Bob will never die! Literally! 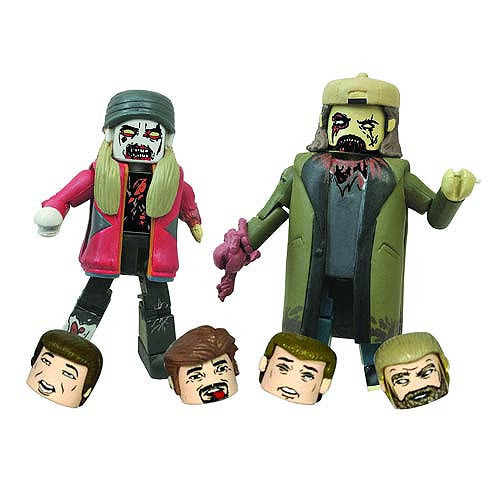 This Jay and Silent Bob Zombie Minimates 2-Pack mini-figures features undead versions of America's favorite comedy team, as seen in the movies, comics and cartoons of writer/director Kevin Smith. This set includes zombie-specific accessories, including a hunk of meat and the severed heads of 4 familiar victims. Each 2-inch Minimates mini-figure features 14 points of articulation and fully interchangeable (and removable) parts. Packaged on a full-color blister card. Ages 8 and up.